As well as drawing my favorite outfits, I would like to also draw people I find interesting. 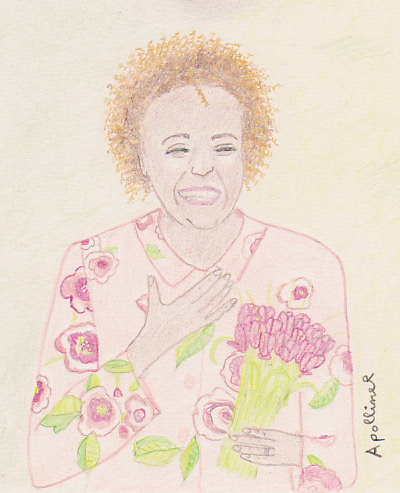 Then, after Wangari Maathai, I have drawn Michaëlle Jean. Michaëlle Jean was Governor General of Canada from 2005 to 2010. It’s an important position as the Governor General is the representative of the Queen of England (who is also Canada’s Head of State) and is Commander-in-Chief of the Canadian Forces. And it is a black immigrant woman who was entrusted with this responsibility. Michaëlle Jean was born in Haiti in 1957. Her family flees dictatorship to to take refuge in Canada in 1968. Her father become violent and divorces her mother. Michaëlle Jean then lives frugally with her mother and her sister. While studying, Michaëlle Jean works for a charity that helps women suffering from domestic violence. Then she pursues a career in journalism before being appointed Governor General of Canada. Since 2010, she has been UNESCO Special Envoy for Haiti.